Feel free to add a photo to your poem. Or use this photo. My poem is free form today. Hey, you know what? It’s 9 days into the new year and we haven’t talked about dishes yet. I KNOW! Well. The DIL and I have casual conversations about cars, mostly about car colors. She likes the way Nissan does Black Amethyst on their Rogue model. I couldn’t afford to give her a car for Christmas but I did find a lovely old candy dish made of Black Amethyst depression glass. If you haven’t seen it, it’s glass that sits there minding its own business looking like shiny opaque black glass and then you hold it up to the light and BOOM! – purple. She would probably rather have had the car but was too polite to say so. I think she liked the candy dish, though. 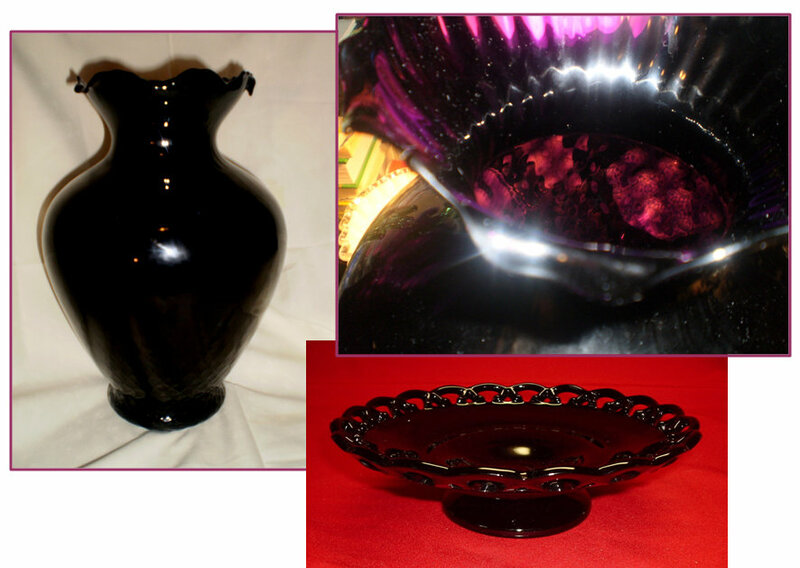 The vase is a good example of the way the light shows purple when held to a strong light. 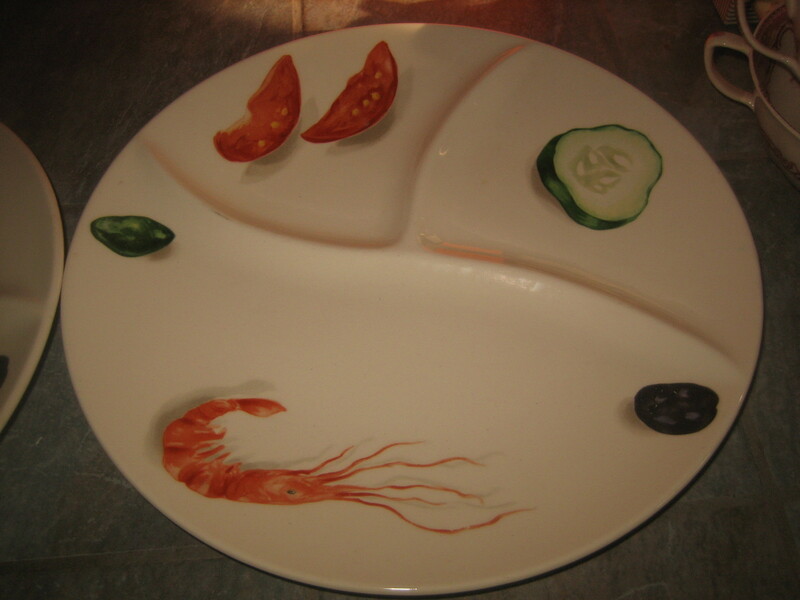 The low dish on the red background is the actual candy dish for the DIL. Back in the summer, I was just cruising around looking at things on eBay and I came across some wacky bowls that had a simple design which reminded me of those 3D chalk drawings that make it look like there’s a hole in the sidewalk but it’s really a trick of perspective. I shared it in an IM conversation with my daughter because it was the kind of off-beat thing she would like – and she did – and then we moved on. But I couldn’t stop thinking about them so imagine my happiness to find that they were still available. I bought them as a Christmas present for my daughter who does a lot of random informal entertaining. Those tomatoes!!! The way the food casts little shadows!!! YES!!! Again no markings or manufacturer ID but of course I snatched them up because who wouldn’t? Duh. 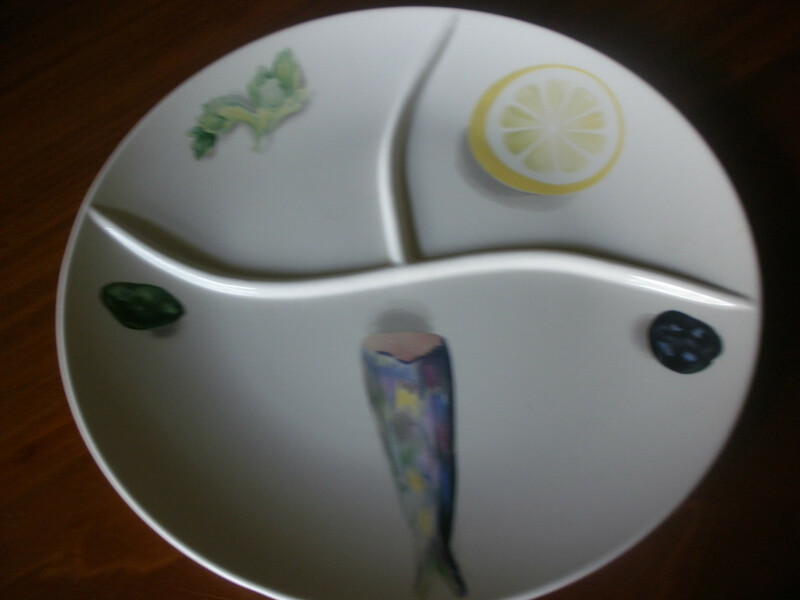 It was set of two and the other plate has a lemon, some parsley and a beheaded sardine on it. … Wait … A sardine, you say? 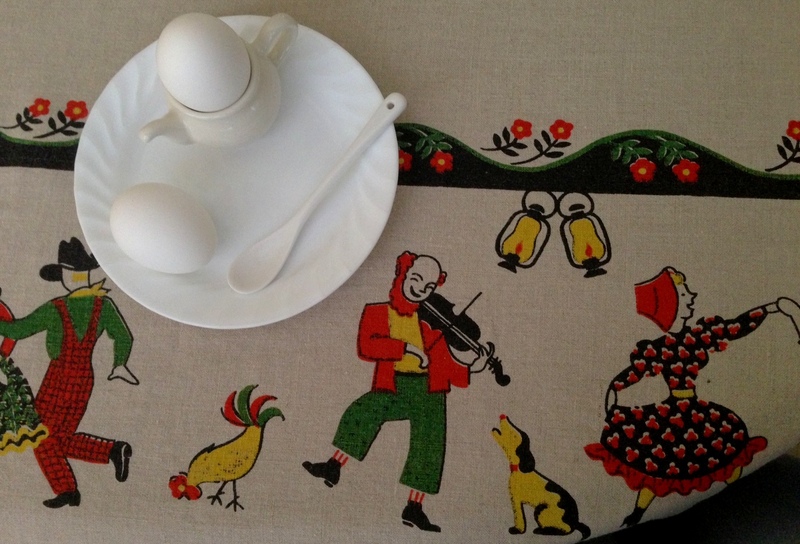 Like they featured on New Scandinavian Cooking?– a cooking show filmed in Norway which just happens to be the source country of Figgjo Flint dinnerware? right? RIGHT? 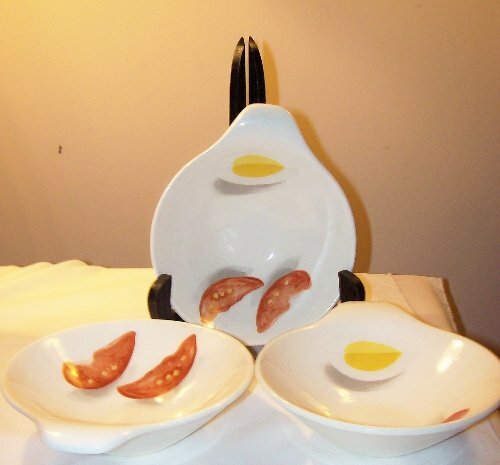 Nothing at all as interesting as these pieces ever shows up on American eBay. Sadly – tragically – the sellers there won’t ship to the USA and even if they did it would be a frightful cost, plus a customs fee and the very likely issue of damage while in transit. 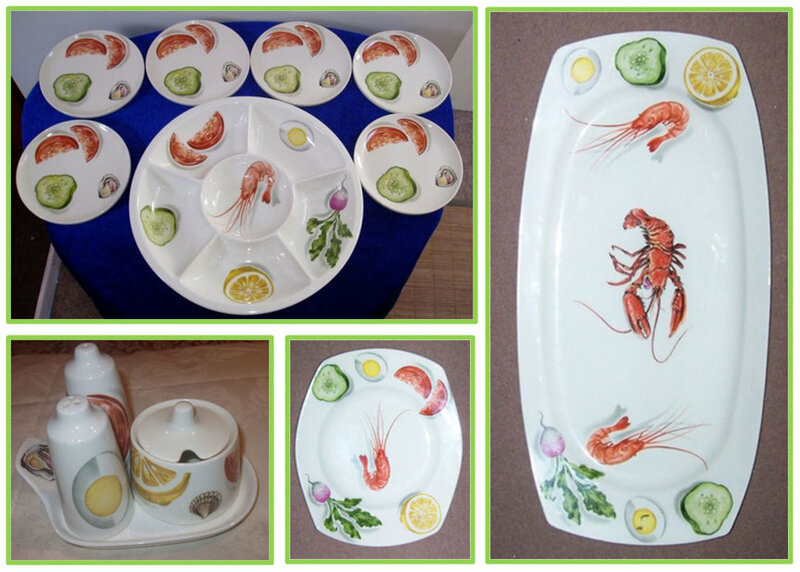 So I continue to do sad random searches for these and to content myself with the knowledge while that I might not have a 7 piece hors d’oeuvre set, I do have possession of the only plate featuring a beheaded sardine that I have ever seen. Post Script: I have a feeling that my daughter doesn’t even like these. What Did Weird Al Know And When Did He Know It? If I was running the Congressional hearings into Benghazigate, the first witness I’d call is Weird Al. Sometimes it’s a burden to know too much. Not only are these the lyrics that run through my head whenever I hear Party In The USA, but there’s no way I can shake Harvey and Sheila whenever the band strikes up Hava Nagila. Q: What is the world’s greatest song? Do you remember on Bewitched when Samantha could summon up the presence of witches and warlocks just by saying something like “Dr. Bombay come right away”? This week, I discovered that I could summon up the presence of my BFF by singing Weird Als “eBay”. Of course, I could only summoned her to GoogleTalk, not to my living room so I’m not claiming to be a witch or anything. I just call upon the power of Weird Al whenever I need a little assistance. Anyway, the BFF and I agree that eBay is the greatest song ever. And of course, after singing it five or six times, who among us can resist searching for an Alf Alarm Clock? OB-viously familiar with the master’s work. Now I don’t know if this is eBay giving the Weird Al fans a little chuckle or if this is the natural progression of search terms after “Alf Alarm Clock”. Either way, it’s funny.